Once the shogun's loyal retainer and now a disgraced exile, Ogami Itto travels a path of vengeance with his son, Daigoro. As the authors of Itto's fall, the Yagyu clan will stop at nothing to bury their treachery, and Itto will stop at nothing to bury the Yagyu! There are many in line behind Yagyu waiting to challenge the masterful swordsman, such as a vengeful widow, numerous police, and the freezing cold of winter itself. 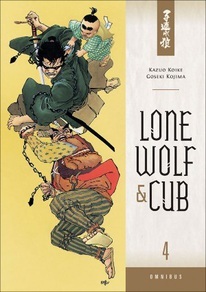 Plus, read the story of Ogami's rise to the position of the Shogun's Officer of Death, feel the seething root of Retsudo Yagyu's bitterness against Ogami, and watch Ogami teach a proud thief about true honor and the wages of deception. Collects volumes 8-9 and three stories from volume 10 in an omnibus format.